Black and white photograph of a young woman in a formal dress. Ms. Mori wears a crown and carries a dozen roses in her arms. 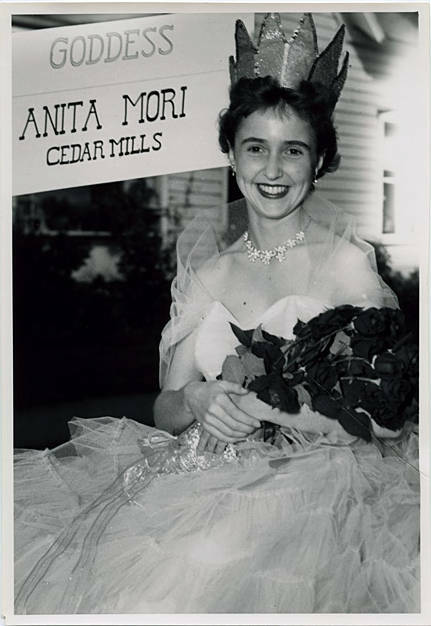 The sign in the background merely reads 'Goddess', but museum records list the photograph as 'Goddess of Liberty, Anita Mori.' The selection of a Goddess of Liberty was often part of the Hillsboro Happy Days events, held over the Fourth of July, dating back to the early 1900s. However, the competition-based selection of local young women as 'Goddess of Liberty' to reign over various local July 4th celebrations dates back to the late 1800s in this area. The dress worn by Ms. Mori indicates that this particular pageant was likely in the late 1940s or 1950s. 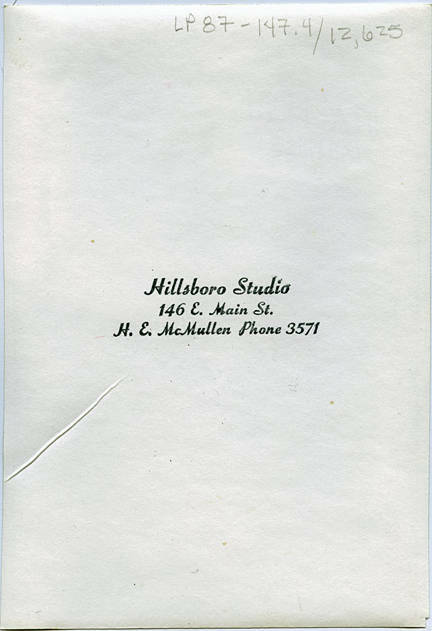 [back] [stamped] Hillsboro Studio, 2nd & Main - Delta Bldg.